Today Bristol DAWG were joined by lovely Lily and beautiful Brad, both Irish greyhounds. Keep checking the Dogs for adoption page for more details when they are ready for ad9ption. 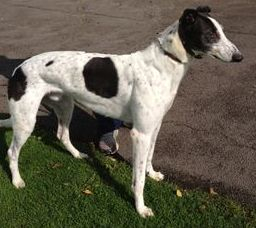 Prince (now Jayme) has found his forever home in Fishponds with Michael and his new best friend Bryn the lurcher. Michael sadly recently lost Louis, who was adopted from Bristol DAWG back in 2010. Bryn, who is now 13 years old, missed Louis and was quite depressed, so Michael decided to adopt another greyhound. Thank you Michael for giving Jayme a lovely new home. 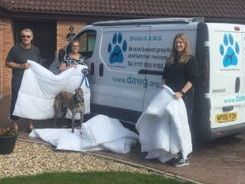 Massive thanks to the Premier Inn for all the lovely duvets and even bigger thanks to Jane Worth for making them into dog beds - your sewing machine must be red hot. We will have lots of nice warm dogs. Karma and Spirit working the crowd at the Trowbridge May Fayre today. Their enthusiasm helped Barbara, Dave and co to collect over £150 for Bristol DAWG. Thank you all once again for your sterling efforts. 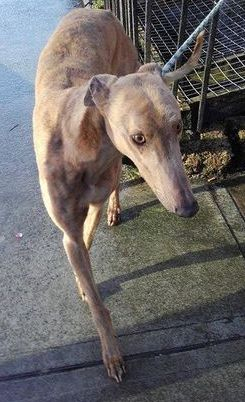 This is an exciting week as Ice and Nano, the two Galgos, are heading to the UK to be homed by DAWG. They should be arriving with DAWG at 19:00 on 20th May. Sadly the Scott family lost their lovely little black girl Suzie (was Carmen when she arrived from Ireland) at a young age due to a tumour on her spine. They really wanted to give another dog the chance of a lovely home so they have taken Sporty into their home and we know she is going to be a very lucky girl. Thank you to Sharon Hunt one of our trustees for very kindly fostering Sporty whilst she was waiting for her for ever home. 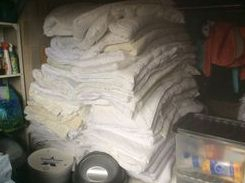 Massive thanks to Alice at the University of Bristol for the huge delivery of duvets, we will have some very happy dogs at the kennels. 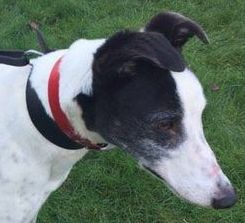 Greyt news - our very handsome boy James has been adopted. 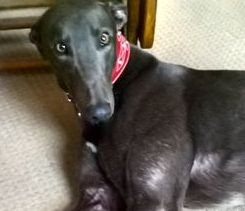 He is now living in West Coker, Yeovil with Jacqui, Tim and their other lovely greyhound boy, Dylan (also a Bristol DAWG dog). James has a new home and a new name - now goes by the name of "Roger". Thank you for giving Roger a wonderful home. We must also say a massive thank you to Denise Smart for yet another successful foster - super foster mum!!! Have a lovely life Roger. Three more lucky dogs will be making their way to Bristol DAWG from Ireland on Wednesday - thank you Eila Moloney for saving them. It was a quiet day at our Melksham fund raiseryesterday – but those people who were around made a big fuss of the dogs, also Greggs and Costa were really welcoming to Barbara, Dave and Lynne. They also met someone who organises a greyhound walk in Lacock and are joining them on June 11th. Dave will be banking just over £136. 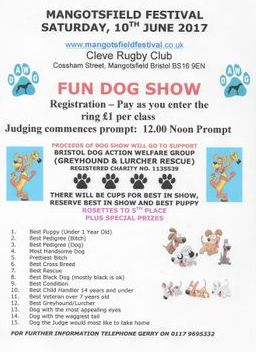 Thank you everyone who turned up today to support the Bristol DAWG Dog Show in Stoke Gifford. 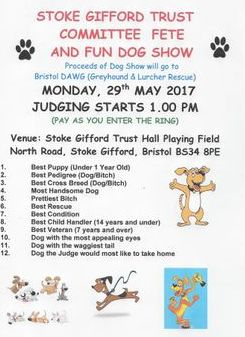 Sadly the rain came and Stoke Gifford Parish Council decided to cancel the event. We were all so disappointed as many hours of organisation goes into such an event. It was lovely to see lots of our previous residents, perhaps you will be able to make the Mangotsfield Festival in two weeks time (hoping for better weather). Thank you to the people who turned up to run stalls. Off to start unpacking all the wet stock, gazebos etc. A very sad day today at Bristol DAWG as we said goodbye to Danny, one of our permanent foster Dogs, at the age of thirteen. Danny had a bone tumour on his hock and there was really nothing that could be done for him. Our thoughts are very much with his wonderful fosterers, Pete and Michelle, who showed him what life was supposed to be like - he was one of the lucky ones. Run fast and free forever, Danny, my beautiful friend.